Welcome to Of Sparrows & Butterflies! My name is Emma (wife, mom, military spouse, homeschool teacher, chef, and maid are just some of my titles). With a family and home to care for, my life, as is yours I’m sure, is crazy and fun. Here I write about so many things, but they all have to do with family, friends, home, homeschooling, or the most important, a daily walk with the Lord. I hope you will join me in this wonderful journey called life and find the joy hidden around every corner. FeaturedPosted on January 17, 2015 January 18, 2015 Categories UncategorizedLeave a comment on Welcome! 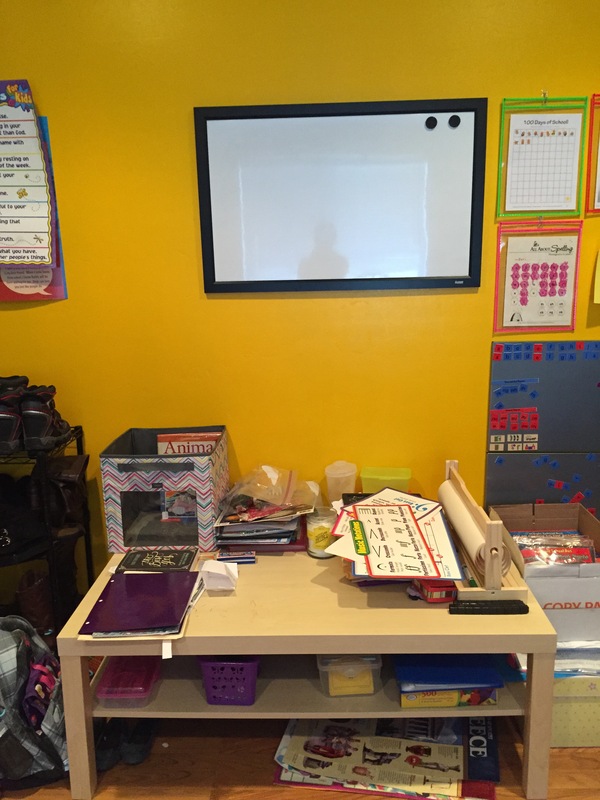 Our Homeschool Room is a work in progress (aren’t they all?). Last year we barely used it because we didn’t have a place to sit comfortably so it was mostly a storage room for homeschool stuff while we used the kitchen table as our work area. But as you can see in the photo below, we now have desks and chairs thanks to a very sweet friend who blessed us with them. Our days of schooling at the table are done (for now at least). If you can’t tell, we love Ikea! Those cube bookshelves, the short table on the left, and the easel are all from there. The table is one of my better finds! It’s normally $24.99 but I got it for only $8 because it has on little scratch on a leg so it was in the damaged section of the store. You won’t always find things you need or want in that section but it’s worth the quick walk through if your already there as you never know what you will find! The shelves hold all our school books, chapter books, science kits, and other resources. I didn’t like the gap between the shelves but putting them together left us with a lot of wasted space. I found the set of drawers that is between the shelves for only $5 at a thrift store and its used mostly for math manipulatives or games that will fit in it. And here is our map! It’s not in the best place as everyone who walks into my home has come in contact with it. But that’s okay, its great to hear the conversations that start with the kids because of it! Well, that’s our homeschool area! 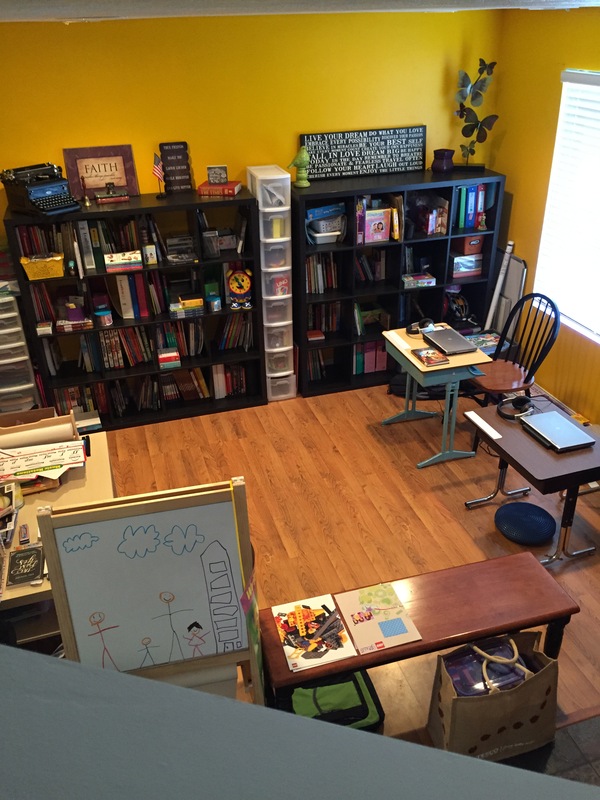 Want to see more homeschool spaces? Click the photo below! It’s finally almost all figured out! If you have been following me for a while you will notice a lot of changes in our choices for this year. Part of that is because what we have used before we either need a break from or it just wasn’t working for our family. The other part is trying to find the perfect curriculum to fit with the kids learning styles. The biggest change is the math we will be trying out. Its nothing like we have used before. RizzyRoo and I really loved Teaching Textbooks last year but we both felt that we needed to try out one more style of learning before “settling” on it. If I’m being honest, I’m actually scared for this year when it comes to math. But if it just doesn’t work out, we can always go back to TT. Anyway, here is what we plan to use! We are still deciding on what Bible Curriculum we want to try out. Its down to three choices now, hoping to figure it out in the next few weeks. What are you using this year in your homeschool? Is there a great Bible curriculum you just have to share with me? For homeschool families finding curriculum is stressful but also exciting! Below you will see all we used/did this past school year with links to where you can buy them so you can see what they look like. Horizons Math 1 -It was time to try something new. We started out the year with this as we loved it last year for his Kindergarten but this year we parted ways with Horizons due to Goobers current need in the way he learns best. Dreambox Math– Goober loved this online program but there are some gaps and its very gamey. I found that the concepts taught on it where learned well but he had a hard time transferring his knowledge to paper even though he could do it all great online. We will use this again but more of a supplement and not the main curriculum. Daily Math Practice- This is what was used to help the skills transfer to paper. It was simple and didn’t add much more work. Great for a supplemental workbook. Teaching Textbooks 3– RizzyRoo loved TT3 and so did I! For the most part she did it all on her own which gave me the time to work with Goober on something. The explanations are great and the practice/work part was just enough to make sure the kids get the concepts without overdoing it. TT is a little behind. Anywhere from half a year to a whole year behind other curriculum so for this next year I would feel we need to do 4 and 5 in one year to finish at the point I want her at. We could do this but we will try out one more math program next year just to make sure we are finding the right one for her. But I do highly recommend TT. All About Reading 1 – I love this curriculum, truly I do. Its well put together and easy to teach. But it doesn’t work for us at this time due to the way my kids learn and my goober struggled with it. So we ending up cutting this out about half way through the year. Language Fundamentals 1– Goober Struggled with reading this year so we online completed a little of this book but it is really good for supplement or to use as a guide for what to teach. Explode the Code Online – We love ETC! But the online program is very slow. We will go back to the books next year. Reading Comprehension 1– Again, with struggling in reading we didn’t get through much of this but it is a great one for reading comprehension. Bob Books– I stayed away from these for so long because of the fact that its a lot of sight words and I didn’t agree with teaching reading with just sight words. But half way through the year and we had made NO progress in reading we added these in to see if they would help. Almost instantly he was reading! Yes most of it was sight words but with the program I’m going to list next he was actually reading and not just memorizing. RazKids– An online reading program that breaks it all down. Its a little repetitive and is gamey but with this, Bob Books, and other reading books Goober is doing so well. He finally is getting it! We will be continuing with RazKids online next year. All About Reading 3– We got through more of this with RizzyRoo then Goober and I do like the program and find nothing wrong with it but it just isn’t working for our family. Language Fundamentals 3- We have used this for her since we started homeschooling and will continue it as a supplement as it covers everything needed. All About Spelling 1– Again, this just isn’t working for our family but is a great program. Explode the Code Online– As I said before, its very slow! The books are better! Reading Comprehension 3– Love these! Helps with their creative thinking as well. Paired Passages 3– Great to start comparison writing with. Story of the World– Love the stories and workbook. Feel it gives a great view without being to biased. Will continue next year. Hero Tales– We got through Hero Tales 1 this year and loved learning about them all. With some we did extra reading online about. Next year we will move onto Hero Tales 2. Wright Brothers– The kids loved this one! They want to do it again! Human Body (year long study)- Did some with our co-op but didn’t get to much at home this year, maybe next. Handwriting without Tears– Great for learners or those continuing to work on their skills. Easy to use and by the end of the year I saw a great amount of improvement in both kids writing. They did 1 and 3 this past year. Four Square: Writing Method 1st-3rd grade- I was so excited to find this program! Its an easy way to teach and an the easiest way I have found for my kids to learn writing reports. They actually like writing now. 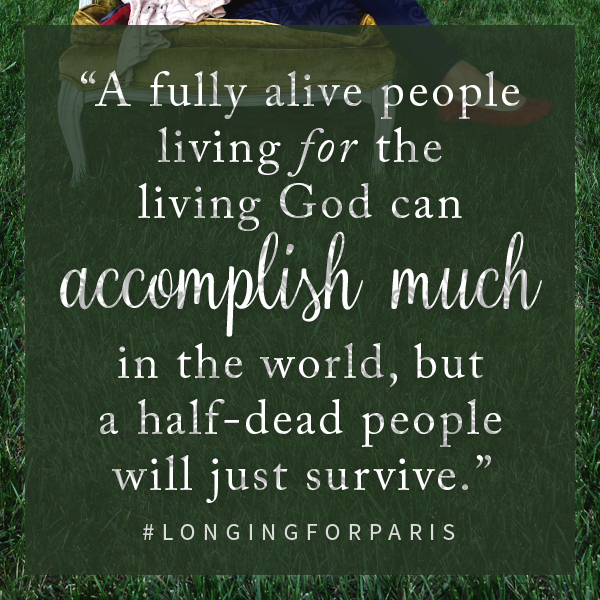 I’m so excited to share that I have been blessed to be a part of the book launch for Sarah Mae’s (www.sarahmae.com) new book, Longing For Paris! Being on the launch team, I was able to read an advance copy of the book and I just have to tell you all, this is THE book you will want to get your hands on as soon as it comes out! In fact, you might just want to pre-order it on Amazon or at B&N! If you’re like me, Sarah, and many other women I know, you have longings-deep longings in your heart that sometimes just hurt so bad because you feel you will never be able to see them come to light. You feel that no one cares about your dreams, or maybe you feel that your dreams don’t matter. It could be that you seek an adventurous life or just something different from the way you grew up. Or maybe you have a desire to be someone different or do something different. Whatever your longings, Sarah shares with us just how important our longings are and why they are so important. “I’m no longer willing to just survive.” This was one of the many things that stuck out to me in this book. It just proved to me that this was where I needed to be – what I needed to be reading. It goes well with my journey to find out just what it means to Thrive. Are you ready to take the next steps of faith to see where God will take you and your longings? Find out more about this book here. Some of my favorite posts out there right now, enjoy! 1.”What reading time looks like in my Homeschool” by The Unlikely Homeschool- I loved this post for so many reasons, but what sticks out to me with a lot of the posts on this site is the honest, non-judgmental way of sharing helpful things that work for her and her family. I love how she talks about the difference in reading from the learn-to read group and the read-to-learn group. I definitely have one of both of those and just seeing it laid out that simple helps me figure out what books my kids should be reading. 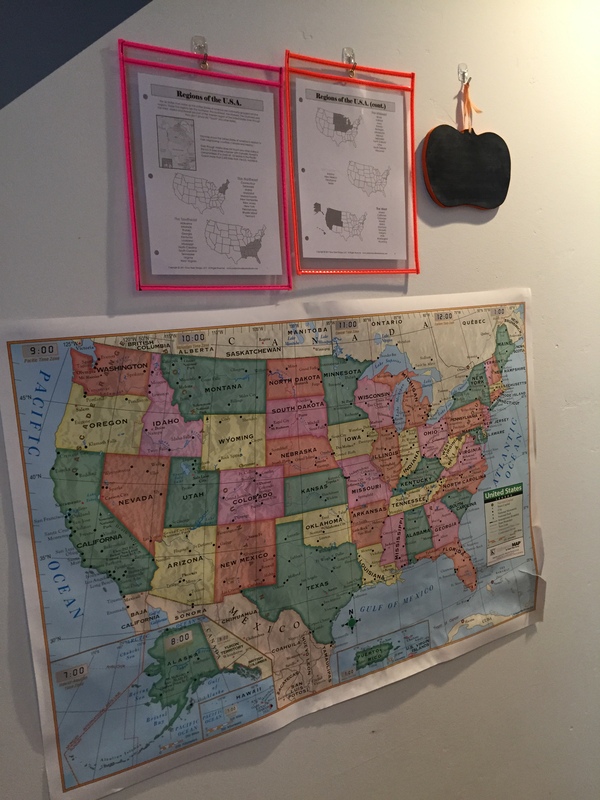 2.”Kids Organized Art Area” by California to Carolina- Such a cute idea that would be easy to do in any corner of your home that really wouldn’t cost that much! Enjoy! 3.”Don’t Allow Bitterness to Grow in Your Marriage” by Matthew L. Jacobson- Great post on Bitterness and how to help fix it in a marriage. 4.”What in the World did I do all day?” by Scary Mommy- Just a sweet reminder that what you are doing is important. 5.”The Kitchen Cabinet Tour” by IHeart Organizing- This post makes me want to go reorganize my whole kitchen! (Don’t say I didn’t warn you!) I hope to soon be able to show off a few of the areas I love in my home that are nice and organized! 6.”10 Cooking Skills your kids should know” by Super Healthy Kids- Some easy but good skills to start with! 7.”Top 10 Language Based Board Games” by The Unlikely Homeschool- Great games to help make learning fun! Posted on May 16, 2015 May 16, 2015 Categories The HighlightsLeave a comment on The Highlights! May 2015! There are many things this past school year that helped make our lives a little better. Below you will find just some of my favorite things. Unless you are strictly unschooling, you plan stuff out. It may be a little or like many of the homeschoolers I know, you plan a lot! I am a planner. And I am picky about my planners, as I don’t want to have too many of them to refer to. I just want one good one. Well, I found it. I have used it since we started homeschooling and it’s been so much help! 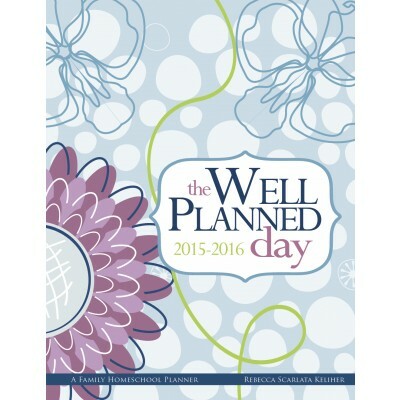 The Well Planned Day Family Homeschool Planner (yes, it is an actual planner for homeschool homes!!) sold by hedua is what I use and LOVE. It has space to write out what you would normally put in a planner, like appointments, then it has plenty of space to plan out your homeschool for up to 4 kids! Has a small weekly section to plan out dinners, as well as shopping lists ready to tear out used for grocery or school stuff! It even has report cards for those who wish to use them! I just love the layout and the little articles throughout the planner. The great thing about this (besides how well it is laid out and how thorough it is) is that if there are parts you’re not going to use, it is still worth getting; just consider those parts as bonus pages. Click here to check out the planner! Almost weekly, we would pull out the box of math manipulatives/tools/games to give us a break from the workbooks and help math be more fun (because you know if it’s fun you remember it better!). 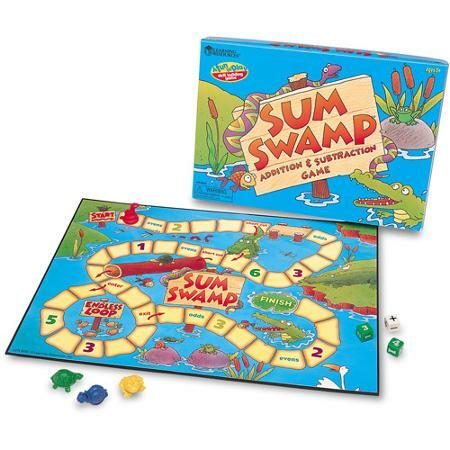 Our favorite so far as been Learning Resources Sum Swamp Game! It’s a basic but fun math game to help with addition and subtraction. It’s for Pre-K and up. For both my kids it’s used to work on their math facts speed (we set a timer), but at the start of the year my son was really learning from it but now its more fun then learning! But it keeps them sharp! These are amazing! 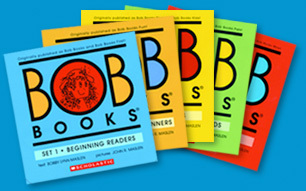 If you have a kid just learning to read or struggling to learn but knows the sounds letters make, give Bob Books a try. Goober struggled all year to read, but it clicked as we worked through these books. And they have just enough silliness to make kids want to keep reading them. Click here for the website to see all their great sets. 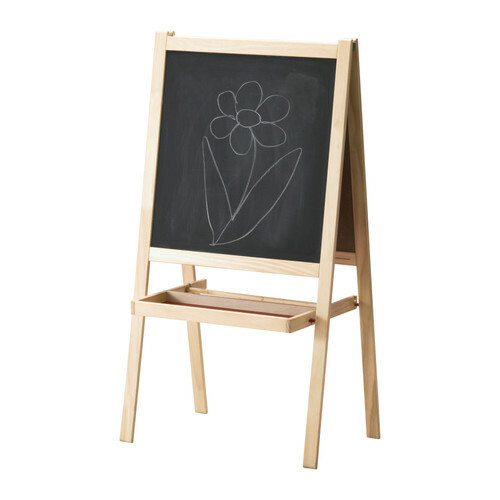 My kids hate writing, but they do it willingly on either the dry erase side or chalk side of our Easel from IKEA. I didn’t think this would last the whole school year and almost didn’t buy it. But it was the best $15 ever spent! Both kids have gone from basic writing lessons to full book reports on this thing. And its also great for art! So there you have it, some of my favorite things from our 2014-2015 school year. Do you have a few favorites? Share with us! *Some links in my posts may be affiliate links. This means that I get a tiny amount back IF you order. I was not paid to write what I said and I am only an affiliate if I truly love the product/company. If you do order from one of my affiliate links, thank you! The little that I get back helps pay for me to get a monthly coffee I call “sanity coffee” (I told you it was just a little back!). I wasn’t raised the military way. I grew up in the same city as my grandparents, and for a while, the same city as some of my aunts and cousins. I saw my grandparents all the time! From them stopping by for coffee, us all having dinner together or the outings we took for birthdays, seeing them at our church for plays I was in, or choir performances. There is no way for me to share just how much I saw my grandparents. My cousins I didn’t see nearly as much, but there was a time that we saw a good amount of each other. We knew where each other’s homes were, and what the connection between our family was, and when it came to decorating the tree for Christmas at grandpa’s home, well, that was always fun! Even with the family that wasn’t really around we were still close with. My cousins on my dad’s side we would see one to two times a year and got along great. We had relationships with a lot of our family. When it came to church and friends, I still have the same friends I grew up with! The church was the same my whole life (except for one year when my parents tried moving us all to another state… That didn’t last). I know the city I grew up in, in and out. I know the restaurants and churches and shopping places. I know many of the people. My children; they don’t have that. Any of that. And this is true for many military families. For the most part you move every 3-5 years, some more often and some less often but that is the average. So every 3-5 years your children have to make new friends, have to learn a new area, a new routine, attend new churches, and some have to be the new kid at school all over while others have to find new homeschool clubs. Yes, they may know of the grandparents and aunts and uncles and cousins, but they don’t really know them. For some that isn’t a big deal because they are social bugs and they can do that. For others, as much as you know they are family, it’s not until the end of the visit that you are back to being comfortable with them. Let’s be honest, it’s hard to be close to people you don’t see that much as adults, how much harder is it for kids? Not many, if any, holidays and birthdays are spent together. When you know something about your family and then a year later you see them again only to find all these changes, it hits kids hard. When your child asks you why their friend’s grandma is always at their home or why the grandma goes to the same church as they and why doesn’t hers, yes you give the answer of “we live in different states because we are a military family”, and so on. Our children don’t really get it. They understand the facts but they don’t really understand the why. It’s so hard on them. One day they will get it; one day they will understand but today, their little hearts just want their family. Their little hearts want “normal”. As a family we all need to work hard to build and maintain relationships with those in our family who can’t be around much. This can’t be a one sided thing or it won’t work. So if the relationship between family is at all important to you and something you wish your children to experience, then lets put in the time and effort to help teach them how. Here are some ideas. 1. Phone calls! Let and encourage our kids to call grandparents, aunts, uncles and cousins. Let them share their day to day life with them and teach them to learn how to also listen. Sure at first this can be a little tricky but they will get used to it, you did didn’t you? 2. Letters! Did you know that hand writing stimulates the brain? It helps with fine motor skills and the thought process. It also help some pour their heart out and be real. And everyone enjoys getting a letter in the mail! 3. Skype! Thank God for Skype! Yes it has issues from time to time but to be able to see the person your chatting with miles away is worth the issues! 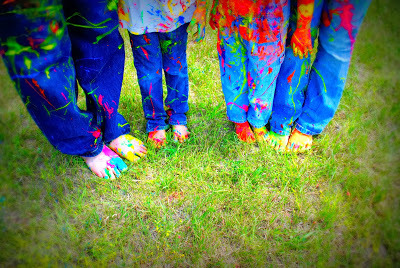 Kids can show off their art projects and get the reactions right away! Family members can join in singing Happy Birthday without even being there! What a great way to build those relationships! Building these relationships have to go both ways, kids won’t always think to start the conversations and they really won’t continue if they are the only ones pursuing it. The adults in their lives need to be actively building relationships with them and not just expect them to start it. How important are these relationship to you? Do you have other ways of building long distance relationships with family? I would love to hear them!